It’s so easy to look at life as a series of major goals and milestones. Accomplishments. When we start walking, start speaking, start reading, start school, Start driving! These milestones make life measurable. They help us celebrate our hard work, and give us a reason to pat ourselves on the back. But milestones can also be dangerous. They aren’t one size fits all. There are often delays and setbacks. And sometimes life throws major roadblocks our way, making us wonder if we’ll ever reach that next goal. So, while we often use the term “hope” in association with those big moments, hope is really a matter of perspective. And todays guest, Bridget Asheim, provides some great examples. Bridget is the Executive Director of Hopekids North Texas. Hopekids is a nonprofit that plans more than 300 events per year for families of children with life threatening illnesses. These aren’t glamorous, milestone events. Rather, they’re everyday fun. Movie nights. Sporting events. Themed parties. The idea behind hope kids is that hope comes from the everyday joys, not the milestone events. In this interview, you’ll hear Bridget talk about some of the friendships and bonding moments that have come out of the Hopekids community. For many of these families, life has been put on pause. And when milestones seem vague, taking hope from the day to day is even more important. Bridget of HopeKids, thank you so much for being on the Zip today. Absolutely. First, can you tell me about your own journey? How did you get involved in the non-profit world? And what pulled you into HopeKids specifically? Sure, I would love to share my own personal story. I have a background in social work, and I was actually teaching at the time, but I first heard about HopeKids, and that was back in 2006, was when I first heard about HopeKids back in Arizona. I attended a going away party for our HopeKids president, who was leaving for Minnesota to launch the Minnesota chapter. We were friends, and went and heard about the charity that he was involved with and really fell in love with HopeKids at that time. Like I said, that was fall of 2006. Then, fast forward to fall of 2007, I was teaching 4th grade, and received a call that our Arizona chapter needed help, and our president thought of me, that I would be a good fit for the Arizona chapter. I’d never really envisioned myself being in the non-profit world, but it just came a-calling. I answered the call and stepped out, away from teaching and away from whatever I was doing at the time, and took the position as our program manager for our Arizona chapter, and that was in June of 2008. Then, I accepted the director position in fall of 2010 for our Arizona chapter. Then, branched off to our North Texas chapter just two years ago as the executive director. It’s been nine years of being involved with HopeKids and just growing not just one chapter, but being involved and now growing a second chapter here in Texas, which has been absolutely amazing to be able to do. You moved from Arizona to Texas for HopeKids? I did, two years ago. Everything really aligned quite perfectly, because my husband works for the airline, and his position was being relocated to the Dallas-Ft. Worth area as well, with American Airlines. Then, when we started talking about that, there was the opportunity for me to relocate as the executive director for North Texas. It really works out. It couldn’t have worked out more perfectly than what it did. Hopekids event photos, thanks to Hopekids Facebook page. Yeah. That’s awesome. Can you tell me a bit about the background of HopeKids as well? I think it’s been around since 2001, I read on the website. How did the organization get started? Just really started with the idea of just what hope can do for a child who is fighting a life-threatening medical condition, and you are correct. It did start back in 2001. Arizona is where it started, and then back in 2006, we launched off to the Minneapolis area in Minnesota. Then, 2013 was when North Texas, here in Dallas-Ft. Worth launched. Then, we expanded quite quickly. Last year was Denver, Colorado, and this year, we launched our Kansas City chapter. Like I was saying, it just really began with the thought that when a child’s fighting and when a family finds out that their child has been diagnosed with a life-threatening medical condition, it can really send their whole world in a tailspin. It just creates a new normal for them. Their schedules that were once filled with everyday events at school and sporting events and birthdays parties, now it becomes filled with, they have to go to the hospital for treatments and procedures and surgeries and all of that. Really, just what hope can do. Having something fun on their calendar, like a hockey game or a theater event or water park event, just anything like that, just to put it on their calendar to give them something fun to look forward to, really instills hope in them. That’s what HopeKids does. 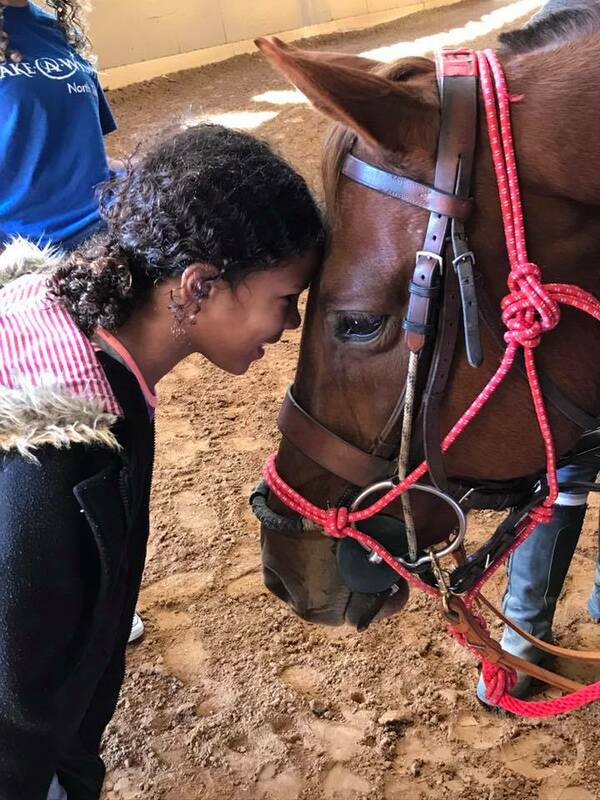 We take their calendar and we fill it up with, for our North Texas chapter, we have more than 300 events every year that we offer to the families that we serve. All of our families have a child that’s either diagnosed with cancer, sickle cell, heart condition, cystic fibrosis, anything that’s life-threatening. 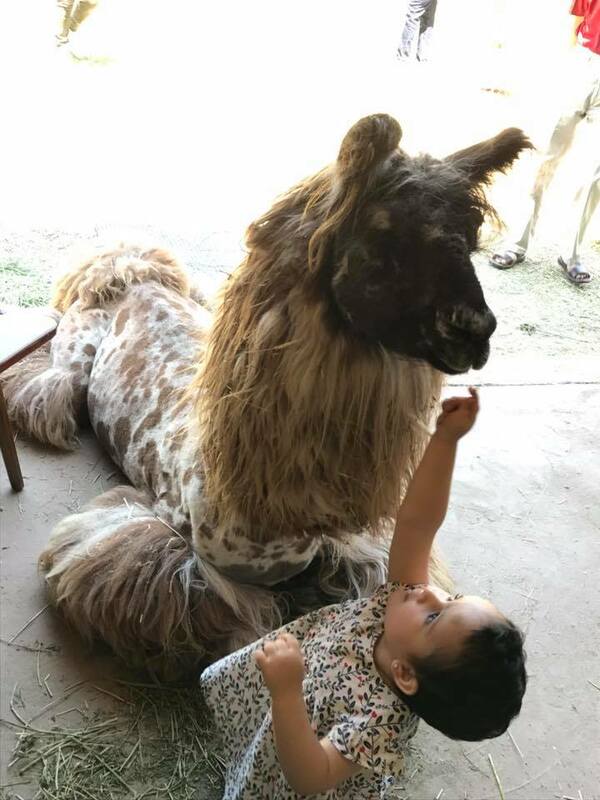 Then, our events are for the whole family. It’s not just the child who’s diagnosed. It’s for the siblings, it’s for the parents who do parent date nights. The families really have the freedom to utilize their events in whatever way that’s beneficial for them. If the parents feel like they need to go out on a date, they can sign up for the Texas Rangers just themselves, and just do a date night. If the child who’s diagnosed is in the hospital and unable to attend, the parents can bring the siblings. Or, if a sibling is particularly having a really hard time, they can sign up just for a mother-son night or a mother-daughter, father-daughter. We give them that freedom to use the events like that. Then, they get to meet other families who understand what they’re going through. They know that they’re not alone. They can see a child that has been declared cancer-free, and if their child’s newly diagnosed, they’re given so much hope when they see other families who have walked the path before them. Then, it’s a chance for them to be in a safe environment. A lot of our events that we do, like our movie screenings at Alamo Drafthouse, they are private just for our HopeKids families. They can walk into a movie theater, and they can see a child that is also wearing a mask or, if they’ve lost their hair, they can look around and see another child that’s lost their hair. If they’re in a wheelchair, it just creates a sense of security for them, when they can once again know that they’re accepted and know that they’re not alone and know that not being in the general public for some of our private events are really beneficial, because they can still come out if they have a little bit of a compromised immune system because our families, they’re not going to bring out sick kiddos and things like that. It just really creates a safe, welcoming environment for them. That’s awesome, and you guys do, you said 300 events a year? That’s almost every day. Multiple times a week. Do you have a big staff of people that’s always coordinating things? We do. We have a group of individual volunteers that sign up through our website to volunteer, because we say it takes a village. We’re a local staff of two people. There’s myself as the executive director, and then there’s our program manager. We’re the frontline team of North Texas, but it takes a village. We couldn’t, like you said, we could not be at over 300 events a year, and we wouldn’t have the capacity to even organize and plan and implement over 300 events in a year. We do utilize individual volunteers to come to our events and pass out tickets and check in our families, be that first person to greet them with a smile. We also utilize our corporate sponsorships and our companies that sponsor events, or are looking for ways to get their employees involved. We do that in a couple different ways. Like I said, a company could sponsor an event for us, because all of our events are free to families. There’s no charge for a family to register and be a part of HopeKids. We either get those donations through in-kind donations, or through company sponsorships. Then, they can bring out their employees to volunteer if they do sponsor an event. Then, we’ve partnered with companies in the metroplex that has also really embraced HopeKids, and then wanting the idea to bring HopeKids to their building. We’ve partnered with companies like Alliance Data and Texas Credit Union, where they plan, implement, and host the event. We’ve done a big trick-or-treat party where the families could come and trick-or-treat at the cubicles, and they decorated their office and planned games. We’ve done an Easter party. 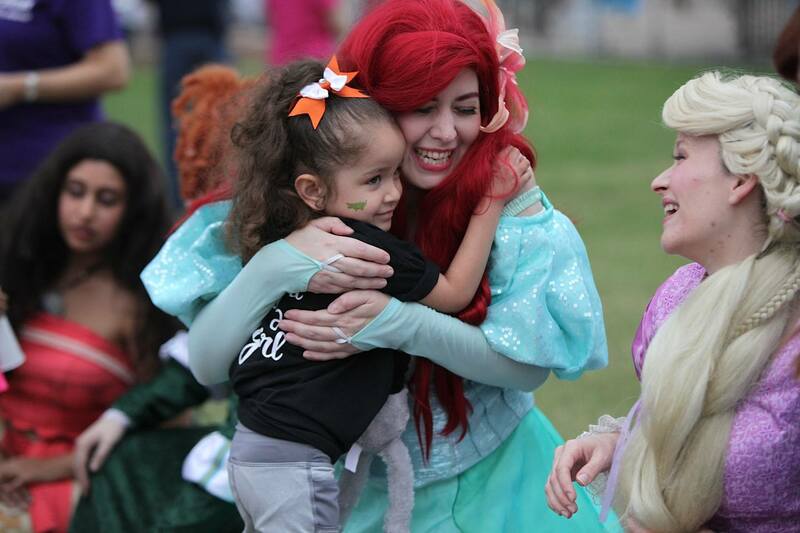 We just recently did a character breakfast with Insperity here in the metroplex. We love, love, love when we can work with companies that say, hey, we have a team that wants to plan, implement, and host an event right here at our office. Those are huge, really impactful ways for everybody to get involved, the whole entire team and the whole entire company. Definitely, it takes a village, whether we get in-kind donations, or we incur the cost and HopeKids pays for it through the generosity of our donors and our sponsors, and then our volunteers. They all work together to really fulfil our mission, provide the ongoing events and the unique support community for our families. Hopekids event with Shangrillama. Hopekids event photos, thanks to Hopekids Facebook page. Yeah, and I feel like, as I was looking into HopeKids, at first, I was trying to distinguish it from something like Make-A-Wish, which serves a similar population of people, but I think, and correct me if I’m wrong, but the difference seems to be that Make-A-Wish does one really big thing for a family in need. Whereas your organization works to give those little moments of hope consistently throughout the time that they’re struggling with illness. How would you describe the transformation you see in a family when they’re given things to focus on consistently that aren’t the sickness? Going back to your comment, I agree. Make-A-Wish and HopeKids, we do serve the same population and have the same qualifying criteria, but Make-A-Wish does what we can’t do. We can’t do the one big wish, where the child says, I want to go to Hawaii or I want to go to Disneyworld. We can’t provide that, but we’re so thankful that there’s organizations out there like Make-A-Wish that can provide that. The difference with us is, we provide the ongoing support, like you said, just building that relationship. We say, we’re there if the child is waiting for their Make-A-Wish, and then we’re there when they get back. They can still have something local here to look forward to, and you’re right, it truly doesn’t take much. I can share a story of one of our teens that we went and visited in the hospital during a hospital visit. We found out through that visit that he likes the Dallas Mavericks, and had received a recent visit from Dirk, from the Mavericks. We were chatting about that. Then, he had spent over 40 days in the hospital, and when the Mavericks called us, because we partner with all the local sports teams here and said, hey, we have these 14 tickets for you to utilize. We were able to then fill them with families. It allows us to build really close relationships with our families, so we can know who’s a Mavericks fan and who needs that little bit of hope. We instantly thought of our teen, and we called up his mom and said, is he going to get out of the hospital soon? She’s like, yes. He’s supposed to get out this weekend. We confirmed that hopefully, he’ll be able to go to the Mavericks game. We went into the hospital with these tickets, and I’ll never forget the comment that he made to us, and this was. This was, gosh, it must have been a Thursday, and the game was Saturday. He told us, he says, I’m going to tell the doctor that he’s going to release me on Saturday for the game, even if I have to come back on Sunday. He had been in the hospital over 40 days, because he wanted to go so bad. We gave him all 14 tickets. He was released on Saturday. Did not have to go back again on Sunday, thankfully, and was able to enjoy invite family and friends. Then, the Mavericks partnered with us to do a high-five tunnel for him, so made it even more extra special. We see those stories countless and countless of times. It could be a movie. It could be the Trolls movie, the Cars movie. We had kids that we super excited when Beauty and the Beast came out, and we partnered with Princesses with a Purpose that brought in the Beast and Belle to our movie at Alamo. That’s another example. It just takes a village to do this, but there’s so much—it can mean so much to the families to have that little bit of hope. For the parents, too, it’s not just for the child who’s sick. It’s for the siblings. It’s for the parents. We had parents that went on a date night over the weekend. Cyndi Lauper and Rod Stewart. Yeah. It’s on your Facebook page. Yes. Donation from Live Nation. Parents are able to take a break and just really enjoy each other. We had moms this past weekend doing a painting event and were able to—we had 19 moms that came out and able to connect and get to know each other and know that they’re not alone, and be able to enjoy some mom time. Just so many different, like I said, over 300 in a year, and growing. We’re adding new event partners and just people that really embrace our mission and what we do. We’re adding new event partners all the time. You also work with families who have children up to two years in remission or post-transplant. Do you find that it can take families a while to readjust to normal life after a child’s illness? It does. That would be the initial, we’ll take a family up to two years for the qualifying—when they first apply, but once a Hope Kid, they’re always a Hope Kid. Once they’re part of HopeKids, that doesn’t change. If they apply within that first two years, and yeah, sometimes it does take a while for them to just really, to work up to applying. There is that day when you check that box that says, yes, I have a child with a life-threatening medical condition. There’s so many emotions that go along with that. But once they’re part of HopeKids, we always say, you’re part of our family forever, unless they want that to change, unless they want that to stop, but they are part of the HopeKids family. That goes through remission and on. That goes through, if we have families that have lost a child, those families are invited to stay part of HopeKids. We do. We get them that they want to stay, and they want that community, because at that point, everything else seems to come to an end. All the nursing care, all just the connections with their doctors and everything, but the one thing that doesn’t have to is HopeKids. We’re still there. One of the powerful moments for me was when, just recently, at a Texas Rangers game, handing out the tickets and be able to sit three families that have lost their child within the past two years, and to be able to sit them together at the baseball game. They know that they’re not alone, and we do parent dinners for [those who] lost their child, just to really work on those connections. 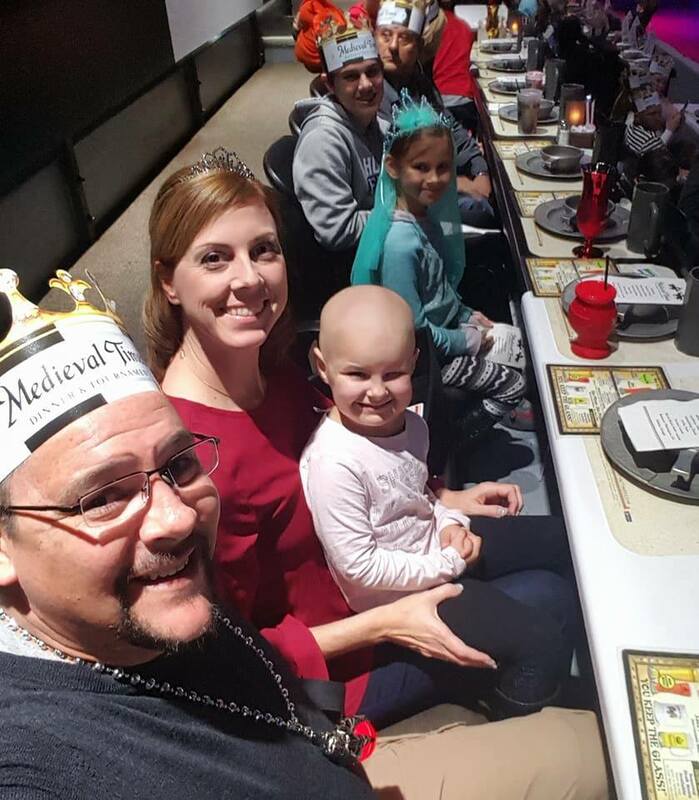 We call that our Hope Community, when we do our smaller, more intentional events, whether it’s, let’s do an event in a private suite with families who have a child diagnosed with cancer to bring our cancers families together. Let’s do a parent dinner for our families who have lost their child. Let’s do a mom’s night out. Painting, like we did this past weekend, so we can connect the moms. We do a dad’s fishing event with their kids. We really, not just do our large, big events that’s everybody’s invited to. We really focus also on the smaller, more intentional events where we can really help cultivate those relationships among the families. Yeah. For you guys, and that’s a bit of what you’re talking about is, hope isn’t just about activities, that you guys are working to introduce kids who are new to an illness, maybe to kids who have survived the same illness. I feel like that must be such a powerful motivator, not only for the kids, but for the families. Are there any examples of that you can share of kids who have helped each other via your program? Yeah. I think one of the things that just instantly comes to mind was, like I talked about, often we’re very intentional about those introductions. I was at an event once with many horses. I was able to look around, and I saw, oh, this family, their daughter is a survivor of leukemia. I was talking to this mom, and her son had just got his port removed. He had just finished treatment. Then, I looked over and there’s another little girl that had, still in treatment for leukemia. Just being able to look at these families and to be able to hear this was an event that everybody was invited to. It was just by chance that these three families were one of the three that signed up, and to be able to bring these moms together so they can then offer support to each other, that was one where it didn’t start intentional, but then it was the lightbulb went off and I saw these moms, like, oh, my goodness. I have to introduce them. Then, I have another example, and this one’s really, I think really powerful. Another example, at our movie event, we had two moms. One was a fairly brand-new family. One had been part of HopeKids for a while. They met at a movie, one of our movies, just by chance. Just happened to see each other and happened to meet each other. Their daughters became friends. Their daughters both have some genetic disorders, and the moms became friends. They started doing things outside of HopeKids, which is what we would hope, that as these friendships form, they not only meet up at HopeKids events, but they’ll also meet up outside of HopeKids and start really calling each other, texting each other, offering that support. Fast forward, the one mother lost her child. The other mother, her child was in the hospital. She’s doing well today, but I went to go visit this family when their daughter was in the hospital. When I came there, there was the moms who had lost their child, and she was there, offering support to this family. To see that the friendship, the bond, the strong bond, was so—at that point, it moved me to tears to see these two moms that, such a deep friendship, and it all happened because of HopeKids. Now, they’re continuing to walk the journey with each other. One having lost her child, and the other one’s still fighting. They’re still there, supporting each other through it all, and that all started because of an event. It started because of a movie at Alamo Drafthouse. You’re right. It starts out like, yes, to go do something fun and free. I don’t have to pay for it. I don’t have to plan it. That’s part of the thing. They don’t have to worry about planning. They can just look at this online calendar and see all these fun events. Then, it’s deeper than that, and as they start attending events, it’s the friendships. It’s the sense of family. It’s those bonds that are created that you can’t put a price on. Yeah. That’s amazing. Slightly different topic, but how do you and your team focus on fundraising? I know you have a couple of events throughout the year, a golf event and Hope Walk in Arlington. Obviously, like you said, all the events are free. How do you raise money to make sure that a lot of these events can happen at no cost to the families? Yeah. Several different ways, and we do three HopeKids driven, where we plan and implement fundraisers a year. Like you said, we have our golf tournament in the spring. In the fall, we do our Hope Walk, and our Hope Walk is the one time of year where we invite the families to create fundraising teams, and raise funds to be used towards our Hope Day program, that we call it. That’s in Arlington this year, on October 7th. We always look for sponsors, and we look for people to come out and walk. It’s a two-mile, all accessible, family-friendly walk. Then, we have mascots and princesses and superheroes, and just other people that get involved. This year, we have confirmed the In-N-Out food truck is coming back again this year to distribute hamburgers and French fries and sodas to our walkers. It’s a really big day of hope. This year, that’s October 7th. Then, we also do a gala in the fall as well. We just confirmed that date, just in the past week. Those are the three fundraisers. Then, we have companies that do third-party fundraisers for us, where they plan, implement, and host the event, and then present us with a check. We do grant writing. I write grants with some of the local organizations and foundations. Then, a real program that I’m passionate about as well is our Hope 365 monthly giving program. That’s where people can come alongside of us and donate monthly, which helps us grow and sustain our program long-term. We encourage people to sign up for $30 a month or more. It’s just another powerful statement of, $30 a month is a few Starbucks for someone. What is it, five Starbucks or something? Six Starbucks in a week. But the power of $30 a month, when you multiply that times, if you get 10 people, if you get 12 people, it creates such a huge—that $30 a month is multiplied and creates such a huge, huge impact for us to grow our program. Some of the things that we’re looking at doing is, with our metroplex right now, we have over 700 families that we serve, they’re spread out all over. Each year, we add—last year, we added over 200, and we’re, I say unfortunately on track to add the same, because it’s bittersweet. Each number is a family that has a child with a life-threatening medical condition. I wish there was no need for us, but since there is, I want these families to hear about us, so they can be part of HopeKids. As we grow, and we have these areas in the metroplex where we have families, but we don’t have events, that’s really what we’re targeting is, where can we strategically place our events so it’s convenient for our families, so they don’t have to worry about driving? They already have to drive to their appointments and procedures. Let’s get events in their own neighborhood. Let’s look at our current events and say, how can we be more efficient and effective? Maybe it’s adding a meal. Maybe so they don’t have to worry about feeding the family before they come to an event, let’s feed them at the event. As we grow our program and as we get more people to come alongside of us to help us grow our program, that’s what our focus is, is to just really—and I know the Dallas-Ft. Worth metroplex is so huge. You have Dallas, you have Ft. Worth, and you have all the suburbs all over. It’s just a really massive area. That’s just our focus for in the coming years, just looking about those pocket areas where there is a need to host an event there. There is a need for maybe another event partner where we can partner together to do this for our families. Then, also, looking at our current events and what can we add to really make it more effective and just meeting the needs of our families? Yeah. That’s amazing. Finally, final question. Since this is a podcast focused on local, I love to ask each guest about the place that they’re a local to. For you, for right now, it’s Dallas. You spoke about how big Dallas is, and I know you moved there specifically for HopeKids, but what’s special about the Dallas region, or the community of Dallas, now that you’ve lived for a couple years? What makes Dallas a unique community? I would just say, even just the Texas feel in general, and just coming as an outsider from, moving here two years to Dallas-Ft. Worth, I love the hometown pride. I love the community feel that everybody here is so friendly and so willing to help and so personable, and just so passionate about their state. That’s been something that I think is really unique to our area here, that I just love seeing. Moving here from Arizona and having lived there for 17 years, and originally from the Midwest, in Minnesota, I just haven’t felt that anywhere. I think that’s the unique thing to our area, is just the hometown pride, and just the real—what is it? Almost like the Southwest hospitality, too. They talk about the, but I have to say, I think the Dallas-Ft. Worth area, the North Texas area, is definitely Texas nice. It’s a different kind of nice. Yeah, I can see that. It’s that accent that’s just so welcoming. It is. It is, and our family just personally has been so welcomed here, and that’s where I think, as we grow this chapter of HopeKids, I think that’s where we’ve been seeing people just really, as they connect with our mission and it really speaks to their heart, I think we’re starting to see just a lot of really generous, giving people that want to come alongside of us and partner with us. I think that just goes back to just the nature of the people here in Texas. They’re awesome. Awesome. Bridget, thank you so much for taking the time to talk to me today, and for all your good work at HopeKids. It’s a really awesome organization. Thank you so much. Well, thank you for inviting me to be part of it, and just thank you for ZipSprout and the help that you’ve given us through some connections made. I appreciate it.